Thus we sailed from Dubai Westwards towards Sir Bani Yas Island. This is an island which looks as if it is a sort of knob that has broken off from a protruding piece of land sticking up into the lower part of the open sea. And that sea is in our case the Persian Gulf with Africa to the South and Saudi Arabia to the North. Bani Yas is part of the United Arab Emirates and shelters a number of important refineries. So this morning while the ship approached it was surround by fishing boats but also by tankers, going in, going out, or being at anchor. As mentioned yesterday there are a lot of shallow areas and the port authorities are putting a lot of effort in to ensure that nothing goes wrong with these tankers. A tanker running aground and spilling oil would be a catastrophe that no authority wants to deal with. Thus the routes through the reefs and shallows are dictated by the port authorities and the only thing the captain can do is follow the dotted line and ensure not to deviate from it. Deviation would mean a very hefty fine and some very upset people on the other side of the VHF. And so we followed the dotted line and dropped anchor by 07.00 hrs. for an official 08.00 hrs. arrival but with the aim to start full tender operations by 09.45 hrs. This is a beach call with the option of doing a 60 or 90 minute tour around the island. The whole setup is somewhat similar to Holland America’s Half Moon Cay but with the difference that there is only sand and the beach is artificially created outside of the regular the coast line. This artificial sand area with a small access road is on purpose as the whole island is a sanctuary or nature reserve for the various indigenous animals from this area that can safely survive and repopulate here. (Think Giraffes, Cheetahs and Gazelles etc.) 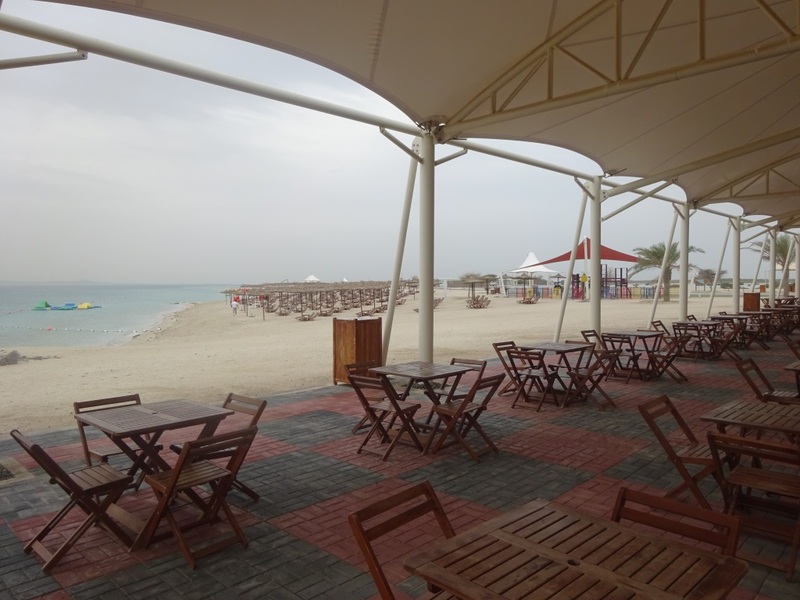 On this artificial strip in front of the coast there are two beach areas which together can handle approx. 5000 guests. The Seabourn Ovation was by itself today so even with 500 guests ashore, the space was still wide open. Sir Bani Ras Island in the Persian Gulf. The black dots indicate our route from the deep water part of the Persian Gulf into the shallows around the island. 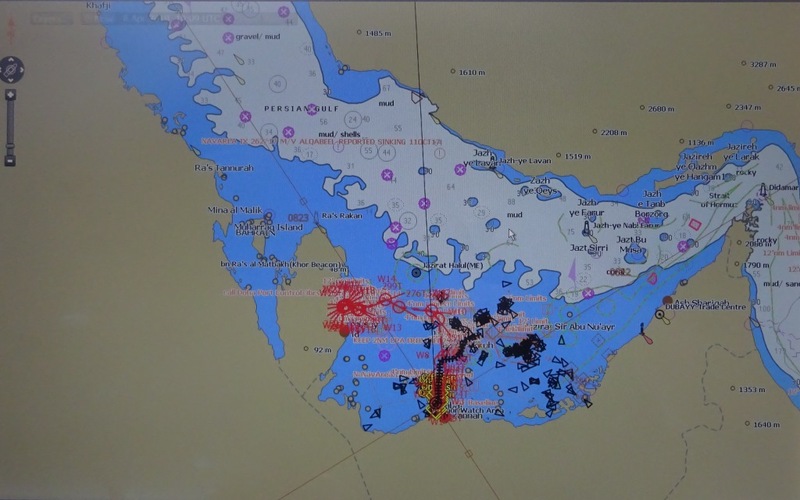 The black triangles are the AIS transponders (Automatic Identification System) of all the ships in the area. 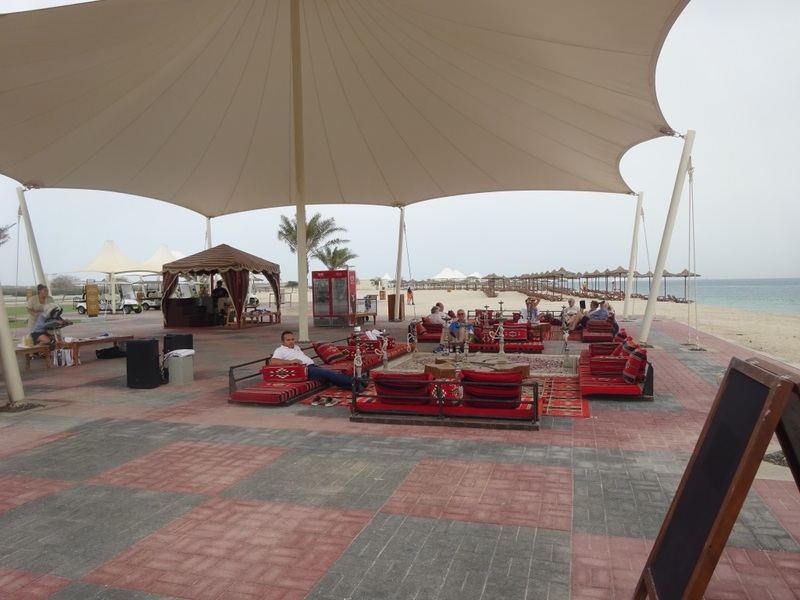 The center area is a covered sitting area which doubles up as the “Barbecue dining area”. While at Half Moon Cay shore tenders take all the food and drink ashore, here the ship’s crew has to do it all by their selves and thus the first tender was full of hotel goods to set the place up. A second tender with all the food followed an hour later. 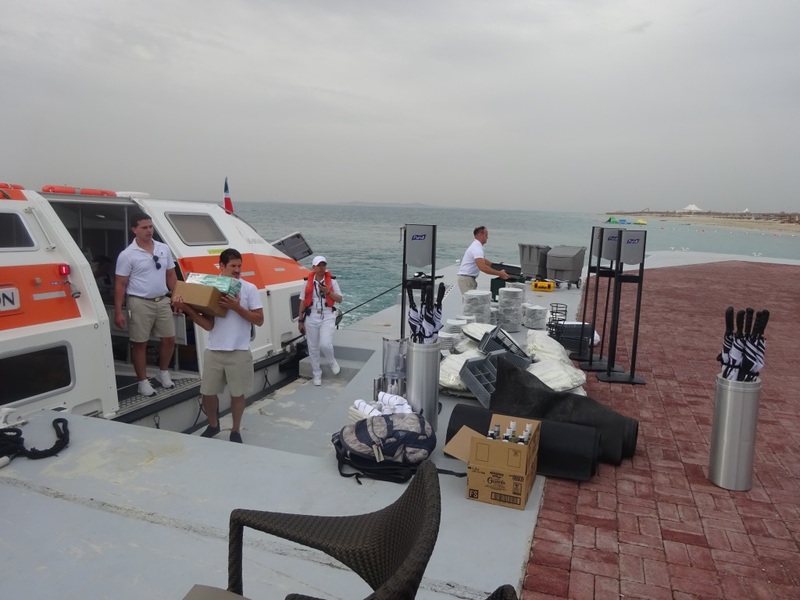 Cutlery, crockery, ice, towels, beverages, everything for a Grand Day at the beach has to be brought ashore by the ship in its own tenders. What is seen here is only a very small part of what came ashore. That is why there is such a gap between the arrival time and the time noted to go ashore. 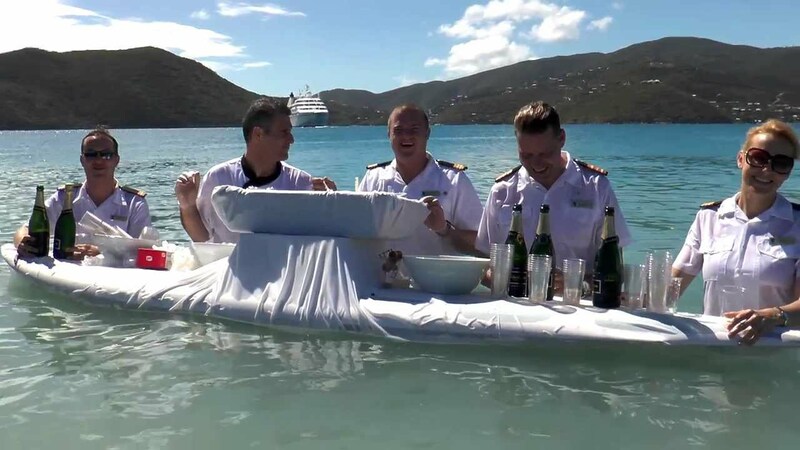 Only when the crew is completely ready to receive the guests ashore in style with complimentary drinks and services can it begin for going ashore, it was a good day, soon after arrival the wind died down; it came back later but not that strong. The skies were mainly overcast but with the sun’s intensity here, that was more of a blessing then a hindrance, as you still could get easily sunburned. For me it would have been a perfect beach day but I had other things to do. 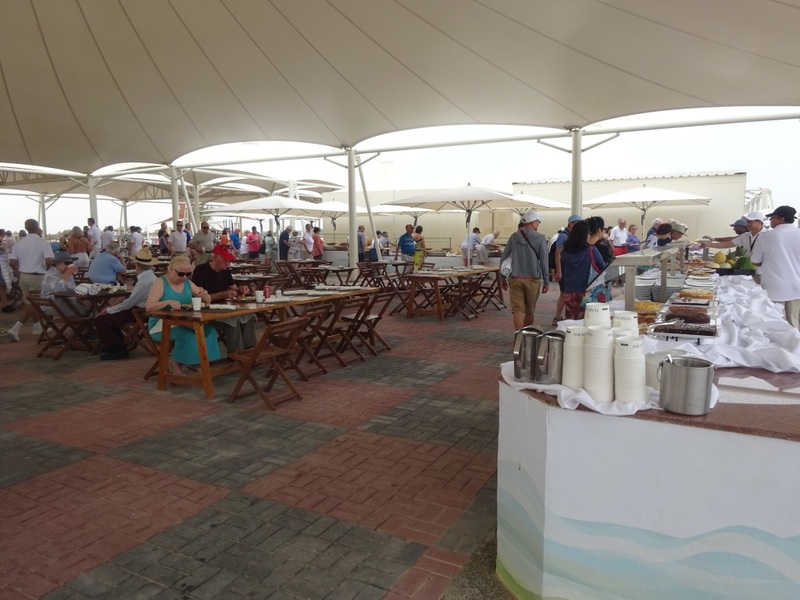 The beach area as seen from the dining area before the guests arrived. For those not into beach things, there was the option of how to learn to smoke a water pipe or to get a gentle massage from the Beauty Department. At 11.30 there was an announcement for the late risers to make their way ashore to be in time for “Caviar in the Surf”. This is a sort of Seabourn Trademark. Shortly before 12, one of the ships Zodiac’s moved along the beach and used the horn to alert everybody on the beach that the caviar is arriving. The caviar with all condiments is placed on a large surfboard floating in the water with the Seabourn crew around it. Then guests can partake from what is on offer with the only challenge of having to wade into the sea. Quite a few guests met this challenge several times with great enthusiasm. For the less enthusiastic, the Barbecue under the tent was quite extensive as well. The Barbecue area which opened just before noon time. This is a full day call and although the last tender is at 16.30 hrs. departure depends is when they get all the materials back from the shore side. Next port of call is Doha in Qatar which has over a million inhabitants and a large port so we can dock there. Weather: Partly Cloudy 89oF . or 32oC partly cloudy and hardly any wind. It is time for sunblock 50. A Seabourn stock photo of “Caviar in the Surf”. I could not get a good shot of the real thing as there was a high density of “caviar experts” in the proximity of the surf board. I could sure go for the caviar now.